Experience a 5-night/6-day program to three major Civil War battlefields (Harpers Ferry, Antietam, and Gettysburg), or enjoy our Snapshot 3-night/4-day program, during which enthusiastic instructors will make your stay in Historic Gettysburg a memorable one. Enjoy classroom lectures and exciting field trips, as well as entertaining and� educational activities! 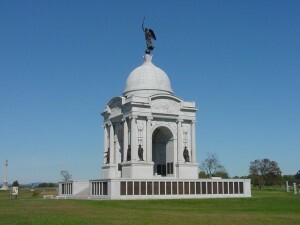 Activities include “on-the-field” programs with the Gettysburg National Military Park and the Soldiers National Cemetery, led by Licensed Battlefield Guides. Visit the Gettysburg National Military Park Visitors Center and Museum for an overview of the Battle. As you learn about each day of the Battle of Gettysburg in a chronological presentation, you will visit the site of that day’s battle.